Secretary of State Hillary Clinton and Rep. Don Manzullo bonded over gefilte fish. (CNN)–Who says there's no bipartisanship in Washington? Democrats and Republicans may differ over health care, but Secretary of State Hillary Clinton and Rep. Don Manzullo, R-Illinois, have quickly come to terms on gefilte fish. Agreement came at the House Foreign Affairs Committee where Mrs. Clinton was summoned to talk about security through diplomacy. Manzullo complained that Israel has slapped exhorbitant duties on gefilte fish prepared by a processor in his district - a large processor, he said, of carp caught in the Mississippi River and Great Lakes. "Passover's coming quickly," Manzullo warned, and the Illinois Republican asked if Clinton could use her influence "to get the gefilte fish to Israel, by Passover." Mrs. Clinton chuckled, but without hesitation declared, "Congressman I will take that mission on." "Thank you, thank you," Manzullo replied, adding that a failure to get the delicacy to Israel could cost "a couple of hundred jobs." Mrs. Clinton promised her "best efforts," describing the matter as "one of those issues that should rise to the highest levels of our government." There may be fighting between parties but when it comes to the faith of peple around the world and jobs, folks can work together. This is funny. I guess that not as many people make it from scratch as there used to be. It is important to get it started since Passover is in about a month or so. Those of us who carry business credit cards understand that personal expenses are never allowed on business credit cards. Remibursing the company is not an acceptable option. What was Rubio thinking? And this is a prime example as to why people don't trust the government to really help the masses. 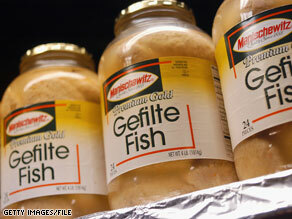 So Gefiltie fish is carp from the mississppi river? Why not dispatch the Coast Guard to collect "Coney Island Whitefish" and have the Navy and Air Force rush it to Israel for their holidays? And after we tell them to cut the crap regarding gefilte fish from the US, we should immediately tell them to cut the crap regarding the Palestinians. No more aid until they behave themselves and stop their expansionist nonsense. Blather on and on about the Palestinians being terrorists and shooting poorly guided rockets that rarely kill anyone at Israel...but first just ask yourself what you'd be doing if you were kicked out of, say, upstate NY by invaders from Britain, who later then handed whatever they captured to the Canadians...who then started building outside of those borders. Yeah...thought so...all you conservatives would be lined up and armed and ready to blow some Canadian heads off. After hundreds of billions of dollars in assistance and military aid, lifting the duties is the least our Gallant Little "Ally" can do. I love me some gefilte fish. Goes down smooth, like a crisp beer on a hot day. YUMMY – There is nothing I LOVE MORE on Passover than Delicious Gefilte Fish with a little bit of horseradish and Matzahs with chopped liver....You Gentiles DO NOT know what you are missing. (How I Seriously Miss those days at my Parents' home when my late Beloved Mother would prepare a large Pesach Sedar. My Beloved Mother was the ABSOLUTELY BEST COOK of Jewish Cuisine. She even made Kreplach Soup from scratch... Oh my, How I Miss My Mother, May She Forever Rest In Eternal, Heavenly Peace. Stories like this are why I voted for Barack Obama in the primaries. What a bullet we dodged..
Government, wasting your money again.